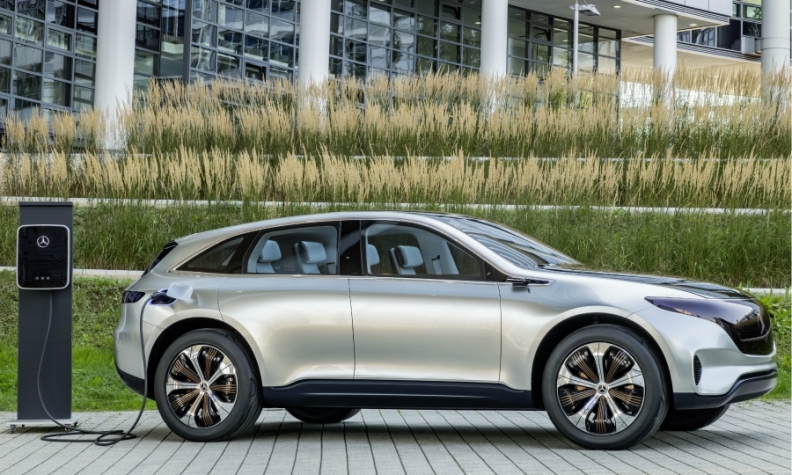 Mercedes' future EV lineup will include the production version of the Generation EQ concept (shown), which has a 500km range. The production car will be the first model from the EQ subbrand. Daimler CEO Dieter Zetsche isn't worried that Mercedes-Benz might be one of the last major premium brands to debut a high-volume full-electric vehicle to challenge already-established rivals such as Tesla Motors and BMW Group. Zetsche believes picking the right time to join the e-mobility movement is a lot like choosing the right time to get to a party: "Whoever arrives too early is alone on the dance floor. Whoever comes too late may have already missed the best part," Zetsche said. Daimler doesn't plan to launch the production version of the Generation EQ concept until the end of the decade because electric vehicles currently account for less than 1 percent of Europe's car sales. For Zetsche, whose company once owned a 10 percent stake in Tesla, the more important year is 2025. By then, the Daimler CEO – who holds a degree in electrical engineering – believes that battery costs will drop to 100 euros per kilowatt hour, or one-third what it was in 2012 when the Tesla Model S debuted. The year 2025 is considered the time when the financial burden of optimizing conventional combustion engines will meet the downward cost curve for the entire electric drivetrain. By 2025, Daimler expects to sell 10 new EVS, including three from it Smart small-car brand, and that those vehicles will account for up to 25 percent of the automaker's total global sales. One of the key members of Daimler's EV lineup will be the production version of the Generation EQ. While this car will be the first model from the EQ subbrand it's not the first battery-electric car from Daimler. It has manufactured small electric fleets of Mercedes compacts, Smart ForTwos and even a battery-powered version of the Mercedes SLS AMG supercar. All were more pilot projects. By comparison, Tesla aims to build up to 90,000 full-electric vehicles this year, while BMW has delivered more than 60,000 i3s and 10,000 units of its i8 plug-in hybrid supercar. In an attempt to win back some of the customers lost to these two, Audi showed its e-tron quattro concept and Volkswagen Group sister brand Porsche unveiled the Mission E prototype. Mercedes' response came a full year later despite the fact that Daimler invested 1 billion euros in a lithium-ion battery pack plant and once even built its own cells. Daimler's head of development, Thomas Weber, told Automotive News Europe the EQ isn't simply a me-too electric car to compete against Mercedes' rivals. He calls it a holistic answer to future transportation needs. "Focusing on comparisons such as range or acceleration is too narrow minded," he said. Weber believes that future vehicles will be judged based on the quality of their electric powertrains, connectivity, autonomous driving features and how well they are incorporated into a shared mobility package. "We want to be the best in the sum of all [four elements]," Weber said. Weber, who will retire at the end of 2016 after 29 years with the company, said packing more range into a battery-powered car is not an art form, since more cells can easily be added. While the EQ currently is specified with a battery capacity of 70 kilowatt hours, Tesla is already offering 100 kWh to boost the distance of its Model S sedan and Model X crossover. Instead, Weber says the true judge of a battery's performance is the number of kilowatt hours adjusted for weight and volume. Here Weber sees dramatic developments ahead in terms of improving the volumetric, or per-liter, capacity based on Daimler's former in-house expertise in building lithium-ion cells. "We expect on average the energy density of a cell to improve 14 percent annually," he said. "So every five years there will be a doubling of the battery capacity without increasing volume."